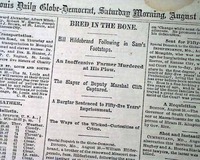 Offered is an original, historic, & collectible old newspaper: ST. LOUIS GLOBE-DEMOCRAT, Missouri, Oct. 31, 1878 * Inventor Thomas Edison * Biography as a young boy This uncommon Midwestern title has news of the day with many interesting advertisements. 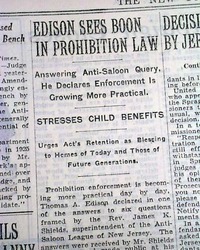 Page 2 has an article headed: "When Edison Was A Boy" with subhead. (see) Text takes up over a full column. Complete in 8 pages, minor irregularity along spine, very nice condition. 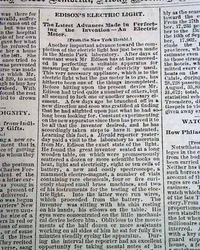 Shown is an original & historic old newspaper, offered to enhance your collectible interest: THE MISSOURI REPUBLICAN, St. Louis, Feb. 3, 1879 * Inventor Thomas Edison * Electric Light Bulb The top of page 3 has a column headed: "Edison's Light" "Already Perfected, bug Requiring to be Cheapened" "Interesting Experiments--What the Professor Had to Say About the Gas Companies". 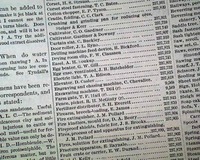 The article takes over a full column. Eight pages, lightly toned, nice condition. Shown is an original & historic old newspaper, offered to enhance your collectible interest: THE BETHLEHEM GLOBE-TIMES, Pennsylvania, October 21, 1931. 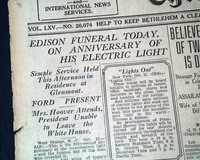 * Inventor Thomas Edison death * Funeral - burial ceremony (day of) The top of the front page has a two column headline: "Edison Funeral Today, On Anniversary Of His Electric Light" with subheads. (see) Other news, sports and advertisements of the day. Complete in 22 pages, a few small binding slits along the spine, generally good. 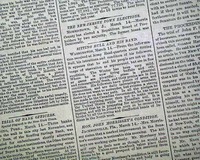 Shown is an original & historic old newspaper, offered to enhance your collectible interest: NEW YORK TIMES (Rotogravure Section only), February 17, 1929 * Babe Ruth birthday photo * Thomas Edison & Henry Ford This section is loaded with photos involving sports, entertainment, fashion and much more. 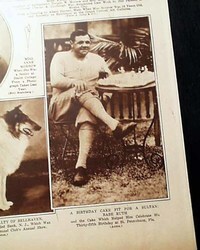 The front page has a photo titled: "A Birthday Cake Fit Four A Sultan: Babe Ruth" Also 2 related photos regarding Thomas Edison's birthday as well. 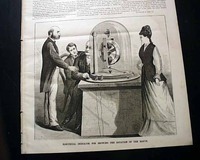 Complete rotogravure section only with all 18 pages, irregular along the spine, otherwise in good condition. 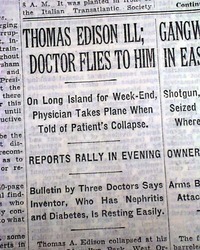 Shown is an original & historic old newspaper, offered to enhance your collectible interest: THE NEW YORK TIMES, December 6, 1919 * Thomas Alva Edison * Manhattan, New York City * Shop advertisement The back page has an unusual ad which includes a photo of Thomas Edison. 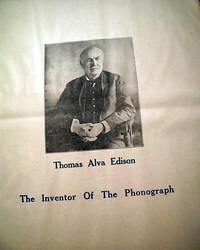 The full page ad is for: "The Edison Shop" in New York City which has a 8 by 6 inch photo of Edison headed: "Thomas Alva Edison; The Inventor Of the Phonograph" and the street address located a the bottom right. The rest of the page is blank. A nice ad for display being on the back page. News, sports and advertisements of the day. Complete with all 24 pages, some spine wear, otherwise nice. 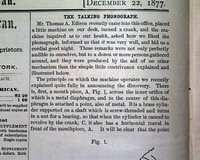 Shown is an original & historic old newspaper, offered to enhance your collectible interest: NEW YORK TIMES, June 4, 1878 * Thomas Edison * Phonograph The top of page 5 has a column headed: "AN EVENING WITH EDISON. 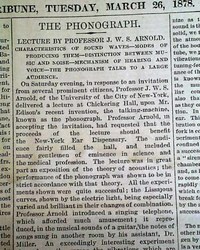 What The Phonograph Can Do." 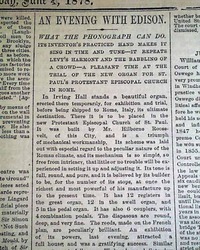 with various subheads including: "It's Inventor's Practiced Hand Makes It Sing In Time and Tune--It Repeats Levy's Harmony & the Babbling of a Crowd..." with more (see). 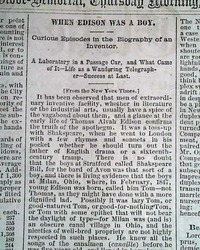 This article takes over half a column and is a great analysis of this modern marvel of the 19th century. Complete in 8 pages, evenly toned, nice condition, should be handled carefully. 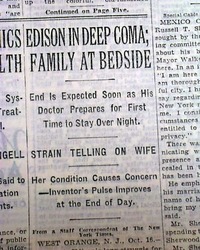 Shown is an original & historic old newspaper, offered to enhance your collectible interest: THE NEW YORK TIMES, August 25, 1947 * Early electronic computers invention * Thomas Edison's wife (Mina) death Page 17 has one column headings: "MRS. EDISON DEAD; INVENTOR'S WIDOW" and "Second Wife of the Discoverer of Electric Light--Mother of Jersey Ex-Governor" with photo of Mina Edison (see photos). 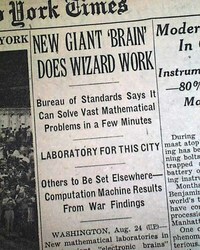 Also one column headlines on page 19 that include: "NEW GIANT 'BRAIN' DOES WIZARD WORK" "Bureau of Standards Says It Can Solve Vast Mathematical Problems in a Few Months" (see) Always nice to have notable events in history reported in this World famous publication. Other news, sport and advertisements of the day. Complete in 36 pages, minor spine wear, generally nice. 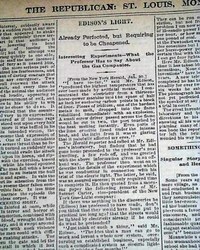 Shown is an original & historic old newspaper, offered to enhance your collectible interest: THE WORLD, New York, March 20, 1878 * Thomas Edison - inventions * Menlo Park, New Jersey The front page has most of a column headed: "Inventor Edison's Last" "A Machine that Will Be Of Immense Value For Various Purposes". 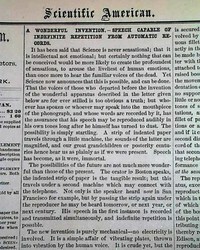 This interesting article is a nice interview with Thomas Edison in which he apologizes to the reporting for not being able to show him his latest invention, the aerophone (just sent for the patent), but then goes on show the reporter his latest improvements on the phonograph, with several demonstrations. Eight pages, never bound nor trimmed, some foxing to the ftpg., mild margin wear, 2 folds. 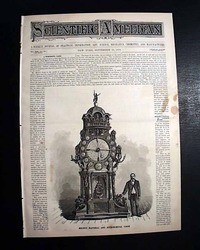 Shown is an original & historic old newspaper, offered to enhance your collectible interest: SCIENTIFIC AMERICAN, New York, March 24, 1888 * Great Blizzard of 1888 * Snowstorm w/ illustrations * Inventor Thomas Edison The entire ftpg. 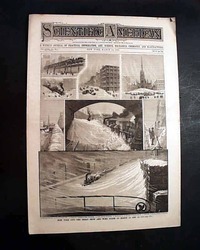 has 8 images of: "New York City--The Great Snow & Wind Storm of March 12 & 13", with more related illustrations inside. 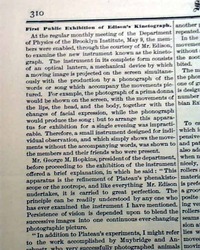 Also inside: "Edison's New System of Telegraphy" with prints of 5 portions of it (see). An interesting article on: "Chinese Kites". Sixteen pages, never bound nor trimmed, nice condition. 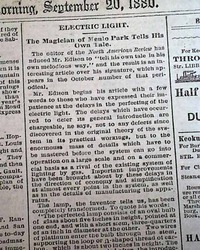 Shown is an original & historic old newspaper, offered to enhance your collectible interest: ST. LOUIS GLOBE-DEMOCRAT, Dec. 6, 1878 * Inventor Thomas Edison * Electric light bulb * Work in progress Page 2 has an historic report taking almost an entire column headed: "Edison's Electric Light" "The Latest Advances Made in Perfecting the Invention--An Electric Meter". Also: "Slaughtered By Steam" "Two Men Instantly Killed & Five Terribly Injured" Eight pages, very nice condition. 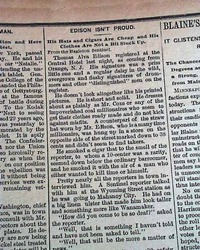 Shown is an original & historic old newspaper, offered to enhance your collectible interest: DAILY TIMES, Bethlehem, Pennsylvania, June 4, 1892 * Inventor Thomas Edison described as humble The top of the back page has: "Edison Isn't Proud" "His Hats & Cigars are Cheap & His Clothes are not a Bit Stuck Up". 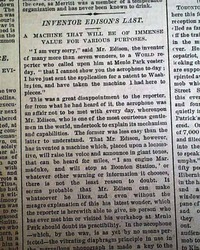 An interesting article on how "ordinary" Thomas Edison is, with a short interview with him as well (see). Four pages, very large folio size, a few minor archival mends, evenly toned, should be handled carefully. 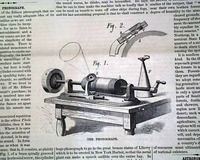 Shown is an original & historic old newspaper, offered to enhance your collectible interest: SCIENTIFIC AMERICAN, New York, Sept. 27, 1879 * Inventor Thomas Edison * Telephone invention Inside has an article: "Edison's Latest Telephone" which is very descriptive text on it. 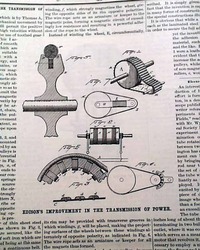 Included as well is a nice illustration captioned: "Edison's New Telephone". 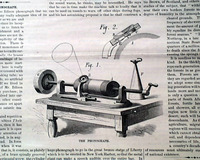 Various other inventions & scientific improvements of the day in this issue. Sixteen pages, some minor staining, generally nice.